Beginning in 1947, the Nelson design office designed a series of new clocks for Howard Miller, whose account it had acquired the previous year. According to Irving Harper, one of the two designers on staff, he was assigned the Miller account and designed all of the Howard Miller clocks, in addition to several other lines, until the late 1950s. An interview with George Nelson names Isamu Noguchi a member of the design team for the Ball clock: "While Nelson, his associate Irving Harper, and Isamu Noguchi were discussing the problem, someone asked, `What is a clock, anyway?' and to illustrate the concept drew a diagram of six lines intersecting each other at midpoint. And so, the Miller clock is a diagram of time's measurements. Harper, responsible for the clock's final development, kept it as close to its abstract beginning as possible." Although frequently discussed in terms of postwar industrial design, the series has a whimsical quality that can be linked to American sculpture of the period. Indeed Irving Harper recalls that the wall clocks, unlike other product design objects, were seen as lending themselves to treatment as works of sculptural art. 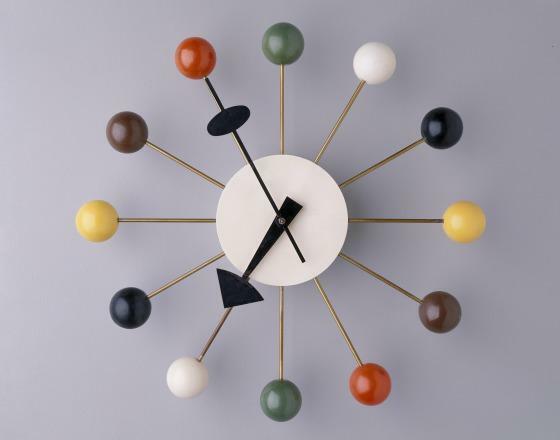 The Ball clock is reminiscent, for example, of Alexander Calder's sculpture of the 1930s and 1940s not only in terms of their formal vocabulary but also because of the interesting contrasts in material, color, and movement.